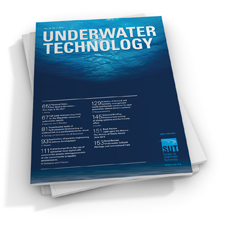 Abstract: Forty seven models of diving computer were subjected to a range of nominal depths (10, 20, 30, 40 and 50m), in freshwater and seawater, in a simulated temperate environment. The depths downloaded from the computers were adjusted for density and compared to the published limits of the EU standard EN13319:2000 for depth-time measurement. The estimated depths for most of the computer models were close to or within the limits for the standard, but were not always near to the accuracies claimed by the manufacturers. Testing was complicated by the manufacturers’ lack of specification of the salinity standards used by most dive computers for the conversion of pressure measured to depth displayed. The mean estimated depths tended toward the simulated nominal test depths; maxima/minima depth differences from nominal were 2.4m/−1.5m and 1.6m/−0.8m for freshwater and seawater tests, respectively. The results from the temperature trials generated a measured range of 5.1°C from nominal values, although the differences in the methods employed either by the computers or the download software to record or display temperature negated standardised comparison. It was concluded that caution should be employed when using displayed and/or recorded depth and temperature data from dive computers in scientific or forensic studies. 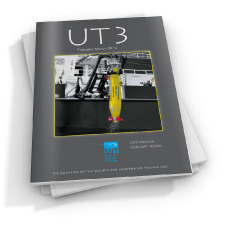 Abstract: Scientific diving is an extremely useful tool for supporting research in environments with restricted access, where remotely operated or autonomous underwater vehicles cannot be used. However, these environments tend to be close to the surface and require the application of advanced diving techniques to ensure that the research is conducted within acceptable safety parameters. The two main techniques discussed are under-ice and cave diving; for each environment the specific hazards are reviewed and methods for mitigating the concomitant risks are detailed. It is concluded that scientific diving operations in these environments can be conducted to acceptable risk levels; however, risk management strategies must outline precisely when and where diving operations are to be prohibited or terminated. Abstract: The hydrogeology and geomorphology of some flooded sinkholes in central Italy have been studied by means of scientific diving techniques. A first group of three sinkholes is located on travertine deposits around the limestone ridge of the Cornicolani Mounts. One of these, S. Angelo Lake, is flooded by the outcrop of the regional water table. The other two, Regina Lake and Colonnelle Lake, are fed by geothermal springs with high levels of gas and are known as Acque Albule (white waters) because of the presence of cloudy layers of sulphuric water. It was possible to identify the S. Angelo Lake as a sinkhole created by the collapse of the roof of a former flooded cave. The underwater survey and water sampling of the Acque Albule sinkholes confirmed the presence of sulphuric springs emitting acidic water. The last studied sinkhole, Doganella sinkhole, is in the sedimentary cover of the Pontina Plain. It was created almost overnight by a sudden collapse in the unconsolidated sediments, and was then flooded by the local groundwater table. The S. Giovanni Lake can be classified as ‘collapse sinkhole’, while the Acque Albule are identified as hydrothermal-karst sinkholes. The Doganella sinkhole shows alluvial and pyroclastic deposits in the submerged section, and its genesis is not totally understood yet. Decompression calculations for trimix dives with PC software: variations in the time-to-surface: where do they come from? Abstract: Dive computers for mixed gas diving and PC software for decompression calculations are often considered as ‘black boxes’ to the diver: they perform part of their function – the calculation of a decompression schedule – but leave the user in a somewhat nebulous state about the relative safety of this schedule. This is because, in reality, the technology, underlying algorithms and utilised constants are not clearly documented, especially if the so-called gradient factors come into play. Gradient factors are sometimes praised as safety knobs for the decompression schedules, or as a unique selling proposition for these black boxes. This paper discusses the impact of gradient factors on the calculation of decompression times, as well as how the different implementations of dive profile data can influence these calculations. With one inert gas in the breathing mixture, the analytical expression for the decompression time is td. However, if there is more than one inert gas present, the decompression time must be calculated numerically. Therefore 480 square dive profiles were analysed in the technical/recreational diving range using one freeware, two commercially available software packages and one private software with numerical methods. There are significant differences in the calculation of the decompression times with trimix gases, depending on the helium percentage. In the present analysis, these differences do not come from variations in the decompression algorithms but rather from different implementations of these numerical methods. Presently, a definitive answer cannot be given about the origin of these variations but the user should be aware that these exist. Seafloor mining: the future or just another pipe dream? 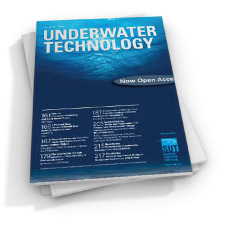 Abstract: Underwater visibility with its spatial variation is an important factor that should be verified by any underwater operator by either divers or remotely operated vehicles. Observations made by a commercial diver and other independent tests are used in this study. Findings suggest that readings obtained with a horizontal Secchi disk made with a transparent tube periscope are representative of the diver observations of underwater visibility conditions. A good fit is also observed between the vertical Secchi disk readings and diver observations: R2 = 0.995. These observations were validated in brackish water outside Stavanger, Norway, and implications of these findings are described. Measurements suggest three classes of visibility conditions affecting a diver’s ability to perform visual activities underwater. The relevance of these three classes for the underwater industry is discussed. Results of this study are compared with observation from riverines in the Niger Delta in West Africa, a region where underwater visibility conditions are of concern during maintenance of underwater facilities. Abstract: This paper discusses oscillation and directional control for a body and caudal fin type robotic fish. The robotic fish is modeled as a free-floating kinematic chain, and two possible control solutions are proposed based on deadbeat and H∞ feedback principles. Results demonstrate that the choice of controller has a significant effect on the resultant system dynamics and performance. While the deadbeat approach delivers excellent signal tracking with relatively little computational cost, H∞ feedback results in a significantly lower total power cost, at the expense of a larger rise time and threefold increase in computational complexity. The findings suggest that for the stated application, the performance characteristics of the H∞ strategy were superior. Abstract: Both the American Petroleum Institute (API) 17N: 2009 and Det Norske Veritas (DNV) RP-A203 (2011) recommend that the technologies inserted into subsea installations should be assessed during design and manufacturing using a technology readiness level (TRL) scale. This should be used as a measure of maturity of all the individual technologies, for qualification and readiness assurance. This paper proposes the creation of a system-based approach for managing the development of subsea systems and making effective decisions to ensure the efficient progress of the project. It recommends complementing TRL with an integration readiness level (IRL) scale, to address IRL between the inserted technologies, along with a system readiness level (SRL) scale to assess the overall project status. It also presents a method for combining the current TRL scale and the proposed new IRL scale to determine an estimate of SRL at all stages of a subsea system development. This provides a composite metric for determining the system readiness level for project delivery. The application of the new proposed scales is demonstrated using a case example. Abstract: The S-lay vessel cannot install steel catenary risers (SCRs) independently after it has finished the pipe-laying process as the stinger of the S-lay vessel is too long and the stinger undergoes a lot of pressure during the installation process. For extending the functions of the S-lay vessel, a special SCR installation system has been designed for the side of the vessel. It provides a solution for the S-lay vessel to install the SCR. Firstly, the SCR installation methods and related concepts are introduced, and the design method of an innovative SCR installation system is described in detail. In addition, a SCR installation method is proposed combining the actual situation of HYSY201 (S-lay vessel) and the environment of the South China Sea. An active truncated test method is taken to verify the security of the designed SCR installation system and the feasibility of proposed installation methods. The test results show that the SCR installation system performs well, and the suggested installation methods satisfy the requirements when using HYSY201 to install a SCR in the South China Sea. Finally, the multifunctional subsea structure installation system, which can be used to install, e.g. pipeline end termination (PLET), is introduced. Abstract: Commercial marine activity has driven the need for technological solutions for the positioning and relocation of equipment on the seabed. Traditional solutions often involve localisation through range measurements to several transmitters, but these active devices contain batteries that require periodic maintenance. For this reason, the use of passive sonar reflectors as navigation and localisation aids is desirable. Fundamental to their practicality is their ability to reflect sonar energy, quantified as target strength. Recent advances in commercial passive reflector technology, as embodied by the SonarBell, have made them a practical technology for underwater positioning. In the present work, the acoustic characteristics of passive sonar reflectors and the SonarBell are introduced. The results of basic sonar equation analysis and target strength from broadband calibration measurements in a water tank estimate the performance that could be achieved using SonarBell within localisation systems. Accounts of two in-field tests demonstrate SonarBell being used practically. Abstract: Subsea power and telecommunication transmission lines play an important role in today’s world. They not only provide a link from shore to shore, but also connect an increasing number of offshore wind farms, wave power plants and other sea installations. Subsea cables have to be periodically maintained and checked for movement in terms of their position and burial depth. This task is difficult because of the dynamic environment of the sea floor, which can cause changes in position, depth, visibility and access to the utilities. In this review, developments in visual and hydroacoustic tracking are discussed, as are theoretical and practical concerns. This review also describes methods and tools for detection of the transmission lines laid on a seabed. Finally, it highlights the need to construct a simple reliable system to estimate the position and burial depth of subsea transmission lines. Abstract: The detection and maintenance of power and telecommunication subsea cables are often difficult and dangerous. Globally, engineers have approached such tasks using different methods. Although the subject is of great importance, there is no single universally accepted method or even agreement about existing methods. This review focuses on electromagnetic detection as a widely used technique for detection of buried cables. The paper reviews practical methods used in electromagnetic detection of subsea cables and ferromagnetic objects. It begins describing the use of simple searching coils carried by a diver and concludes with techniques that implement magnetometers on autonomous survey platforms. The methods used in electromagnetic subsea cable detection are often based on simple and established technologies. Despite this, detection of general ferromagnetic objects in the subsea environment is an active area of research. 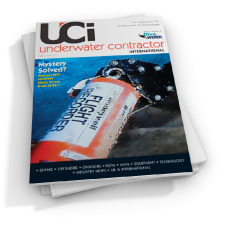 This review also describes developments in underwater unexploded ordnance detection, which can be technologically transferred to the detection of power and telecommunication cables. Abstract: Modern fast ferries produce energetic, long-period waves when travelling at high speed in relatively shallow waters. These waves pose potential risk for divers operating in shallow near-shore areas. While ferry wake-induced problems for coastal ecosystems have been widely studied and regulations have been put in place, the subject has been largely missed in occupational diving discussion. This technical briefing presents the background information on the issue and discusses risks related to diving operations. Basic precautions are suggested to avoid incidents while diving in the vicinity of ferry routes. Abstract: The present paper presents a survey of the water-filled Ojamo limestone quarry, located in southern Finland and abandoned c. 40 years ago. In order to estimate the biogeological state of the quarry, the geological and hydrographic properties were measured, and phytoplankton and zoobenthos sampling was carried out by SCUBA diving. Ojamo can be considered to be mesotrophic. The zoobenthos was lacking bivalves and insects. The Ojamo water body had good oxygen values owing to its connection to the groundwater. Abstract: A series of laboratory-scale T-bar penetrometer tests have been conducted on a clay bed virgin consolidated from reconstituted high plasticity marine clay. This investigation was mainly concerned with the effects on the penetration resistance of rate of penetration and the presence of free water on the surface of the clay bed. The rate of penetration varied between 0.005mm/s and 50mm/s. The results showed that the nature of soil resistance was ‘undrained’ over the range of speeds studied, and the resistance showed a marked viscous rate effect. The virgin consolidated clay bed exhibited an increase in penetration resistance by up to 35% for a factor 10 increase in rate of penetration – much larger than values previously reported for kaolin. The presence of water on the surface of clay bed had a profound impact on penetration resistance, particularly on the remoulded strength obtained by taking the T-bar through successive penetration and extraction cycles. This was true even when the remoulding cycles were conducted without the T-bar breaking through the clay surface. Abstract: The increasing world energy demands for enhanced oil and gas recovery in the offshore industry has led to new subsea technology developments with increased system functionality. Technologies such as subsea processing and instrumentations for subsea control data acquisition place a greater demand on bandwidth, power and capacity. Therefore, the legacy controls system becomes obsolete and proves unsustainable in supporting the increased functionality placed on it by the new subsea technologies. With the fast evolution of electronics, the replacement of the core components of the control system when they fail becomes difficult as they are no longer being produced or supported by the original component manufacturers (OCM). 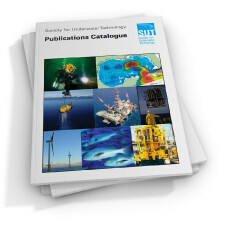 The present paper explores the different strategies in addressing obsolescence on the subsea controls system for offshore field developments. Abstract: The present paper presents the design and implementation of compact and robust medium-voltage switchgear for the deepwater remotely operated vehicle (ROV) ROSUB 6000. Electrical and control systems in the tether management system (TMS) and the ROV are powered by a voltage of 6.6kV at 460Hz transmitted through 6,000m umbilical and 400m tether cables. Any fault in an ROV system could lead to failure of the complete system. Thus the ROV needs to be isolated by medium voltage switchgear located in the TMS. Using conventional circuit breakers inside pressure-rated enclosures with feed-through could be a possible solution, but they are not attractive because they affect the volume occupied and thus weight and costs. The proposed solution involves adoption of a low-voltage air break contactor in an insulating oil-filled pressure-compensated enclosure and uses the subsea environmental conditions to operational advantage. To further ruggedise the oil-filled pressure-compensated switchgear and make its life-time independent of load break conditions, the switchgear opening sequences are controlled using programmable automation controllers distributed in the ship, the ROV and the TMS. The hardware developed is proven to work according to the requirements. The present paper further explains the extendibility of this idea to futuristic subsea systems that will involve high-power switching operations.